"Cigar City Brewing could not be happier than to partner with another great Florida institution, that being Carnival Cruise Lines. 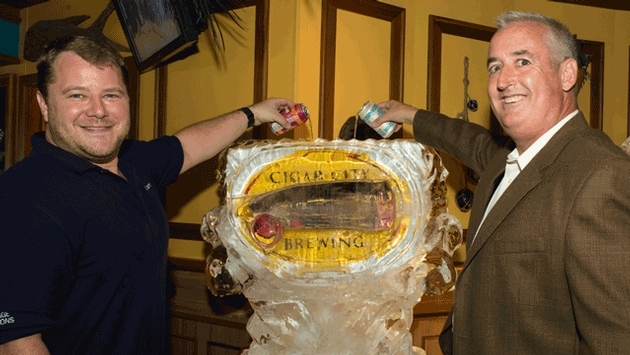 Everyone at Cigar City Brewing is thrilled to start this wonderful partnership," said Joe Burns, national sales manager for Cigar City Brewing. Gold in color, Invasion Pale Ale is Cigar City's version of a “session” beer (a beer with a relatively low alcohol content), in a hoppy ale that celebrates Tampa’s alleged history of being a pirate hideout. The tropical aroma offers suggestions of peach, mango, lime and papaya. Invasion has a light caramel malt character laced with a slight “breadiness” and the finish offers a bounty of tropical and citrus hop flavor and bitterness. Unlike most U.S. craft breweries, Cigar City Brewing packages most of its beverages in aluminum cans. Aluminum cans are the most widely recycled containers in the United States, and aluminum may be reused repeatedly without loss of strength or quality. From a beer drinker’s perspective, cans have zero light penetration to better preserve the integrity of the brew, they chill faster, are easier to store and have a longer shelf life than bottles. Cans also are shatterproof and therefore are allowed where bottles are not — such as poolside. Producing new cans from recycled aluminum reduces greenhouse gas emissions by 95 percent.